To celebrate the rich history of athletics excellence at Trinity College spanning more than 160 years, the college has established an Athletic Hall of Fame that will induct its inaugural class in the fall of 2019. The Trinity College Athletics Hall of Fame will honor the men and women who, through athletics participation, coaching or service, have distinguished themselves in the field of intercollegiate athletics, brought honor and acclaim to Trinity, and contributed to the success and advancement of intercollegiate athletics at the college. Nominations for the Trinity College Athletic Hall of Fame are now being accepted in four distinct categories: student-athletes, coaches, athletics administrators, and athletics department staff. The 11-member Selection Committee, consisting of alumni, coaches, faculty and staff, will choose the inaugural class in the spring of 2019, and Trinity College Athletics will host a Hall of Fame Induction Ceremony in the fall of 2019. 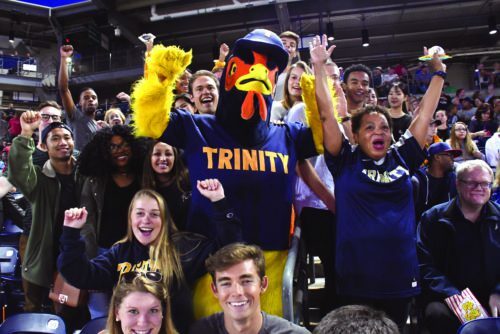 Trinity College has a strong and storied athletic tradition that prides itself on a broad-based program that sponsors 30 sports — 15 men’s and 15 women’s. Sports have always been a part of the fabric of life at Trinity. In 1856, they created the College’s first rowing club. They played their first baseball game against another organized team just three years after the Civil War. Our students have played intercollegiate football for 138 years, and they have played basketball since 1896. In 1969, the College became a coeducational institution, and a women’s varsity sports program blossomed. The varsity teams compete in the New England Small College Athletic Conference, arguably the toughest NCAA Division III conference in the nation. Bantam teams have captured 26 national titles in eight different sports, including 24 titles in the last 20 years. The call for nominations for the fall 2019 induction ceremony has ended.